Today I want to cover proper and improper exercise technique for the split squat. I’ll go ahead and note up front that everything I’m going to discuss would apply to the myriad lunging variations as well. The only difference is the added component of movement (forwards, backwards, alternating or whatever). Recently the split squat in one form or another has come sort of the forefront due to a rather popular strength coach’s belief that the split squat (more specifically a rear foot elevated split squat) can and should replace back squatting for athletes. While I won’t go that far, the split squat can certainly be a useful movement in many situations. One is when a bilateral leg imbalance, that is a strength differential between the right and left legs, develops for some reason. The split squat is one of many ways to go about correcting this. A second place where the split squat can be useful (and this seems to be the main thrust of the strength coach mentioned above’s argument) is when the low back is limiting squat poundages. Since there is far less low back involvement (as a function of both lighter loads and a more upright torso) compared to back squatting, split squats and their variants can be used to either limit low back stress or as a secondary movement for legs after the low back has been fatigued (e.g. after deadlifts when something like squatting would go poorly because the low back will give out). Additionally, in situations where a lifter either must use lower weights (e.g. they only have access to a limited amount of weight as dumbbells for example), a split squat can still provide some overload to the legs while requiring less absolute load. There is also some interest in ‘unloading the spine’ for athletes and, again due to the lower absolute loads used combined with less forwards lean, split squats would be a way of achieving that. I would note that some lifters can use loads in the split squat that actually approach their back squat numbers, this is especially true if they actually squat to parallel or below; so the premise that a split squat automatically lightens the loads used or needed is not necessarily correct. There are two major reasons for this apparent contradiction: how can someone possibly use more weight in a single-leg movement than a double leg movement. 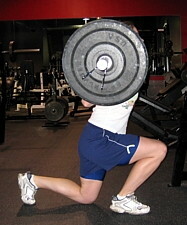 The primary reason is that the range of motion on the split squat is lower than a parallel or full squat. So using a split squat so that you can use less weight may actually not have the desired effect. A secondary reason especially applies to tall lifters for whom low back fatigue/weakness or a massive sticking point in the middle tends to limit their back squat weights. By avoiding the weakest portion of the movement and taking the low back out of the movement, often heavier weights can be used in the split squat compared to a below parallel or full back squat. Of course, many if not all sports are done unilaterally (e.g. single leg alternating which is involved maximally) and an argument is sometimes made that one-legged work is more specific to sports for that reason. As I discussed in the article Squats vs. Leg Press for Big Legs – Q&A, the Aussie track team uses the one-legged leg press for this reason; it’s worth noting that it’s used in addition to heavy bilateral loading and I’m not really going to get into the specificity of training argument here. Sufficed to say that the split squat can be and is a useful movement and, as always, that means doing it correctly. So lets’ look at how to do it (and some of the common variants) correctly. As would be expected of any compound lower body movement, the split squats hits a variety of movement with the glutes, hamstrings and quads being primarily involved (with the degree of involvement depending on the variant performed). The upper back is involved in holding the bar of course and while there isn’t as much involvement of the low back compared to a back squat (due to less forwards lean), the core musculature is still clearly going to be involved. First I want to show the basic start and end position for the split squat. The start position is on the left, bottom position is in the center. 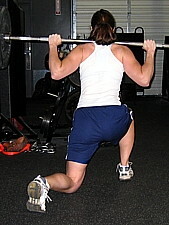 Note that the back knee should not be touching the floor at the bottom position. It will be close but should not touch or slam into the ground. I’ve also shown the proper upper body position (without weight) with the chest high and elbows under the bar (mostly) in the far rightmost picture. Key things to note here are that, in the top position both knees are slightly bent with the feet split fairly far apart. In the bottom, both knees make roughly a 90 degree angle in the bottom position. From the bottom position, the lifter simply stands back up, of course. Moving to the back view, it’s important for the feet to be the proper width from side to side. The picture below shows the proper width, note that the legs are both straight relative to the torso with the feet at roughly hip width. I’ve shown both the start (left) and finish (right picture) below to show the proper leg positioning. Please note: it does look like the lifter’s left leg is angled out a bit below but that’s because of the camera being in the wrong place. In terms of exercise variants, the split squat can be done in one of three different ways depending on what muscles the lifter wants to emphasize. The ultimate determinant of this is where the front foot and weight ends up in the bottom position. In the left photo, I’ve shown a quad dominant split squat, notice that the knee is pushed very far in front of the front toe, the weight is on the ball of the lifter’s foot. In the middle, I’ve shown a split squat that will hit quads/glutes/hams fairly evenly, the front knee has moved forwards slightly but the lifters weight is at mid-foot in the bottom position. Finally, on the right, I’ve shown a glute dominant split squat, the shin stays basically vertical and the lifter sits back with the weight on their heel. Of course, if you take these same types of variations to lunging, you end up with even more potential variants depending on if the lifter steps forwards, steps backwards, walks continuously, etc. All of the same basic concepts apply. As well, the back foot or front foot can be elevated on a step. 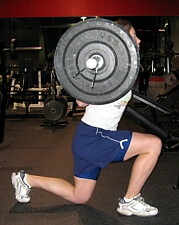 A Bulgarian split squat is typically done with the back foot up on a high bench; often the hardest part of the movement is setting up with weight. Moving on to common errors, it’s not uncommon for lifters to drop their chest/round their upper back in this movement (just as they do front or back squatting). A proper chest raised/upright torso position is shown on the left, a dropped chest on the right. The latter tends to be common with lifters with poor flexibility. 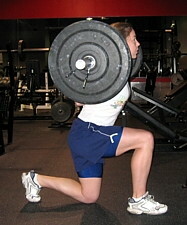 In addition, there are a couple of very common technique errors that show up with split squats (and lunging). One of the most common mistake that people make in terms of foot position and that’s to have the back foot far too close to the front. A proper back foot bottom position is shown on the left, the foot too close position is shown on the right. As noted under basic technique, in the bottom both knees should be at a roughly 90 degree angle. As you can see in the right picture, the back knee is bent far more because the back foot is too close to the front foot. A second common error has to do with leg position front and back. As noted in basic technique, the feet should be hip width with both legs forming a straight line with the torso. Perhaps the most common error is for people to try to place their feet too close together as if they were walking on a tightrope; this makes balance nearly impossible. A second error is to have the back leg too far out to the side which puts a lot of stress on the back knee due to the angle involved. I’ve shown proper foot position on the very left, feet too narrow in the middle and left leg too far out on the right. A properly performed barbell split squat, with weight at mid-foot is shown in the video below. While I’ve shown the split squat being done with a barbell, obviously the movement can be weighted with dumbbells or other means (e.g. weight vest) as needed. Grip can become an issue with dumbbells as people get stronger but the set up can be easier as the bells can be left on the floor and simply picked up rather than having to set up out of a rack. 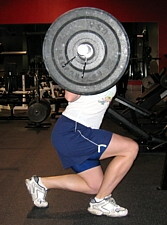 Some have also advocated split squats done with the bar held on the chest, as in a front squat. This apparently used to be a very popular accessory movement for Olympic lifters who split cleaned. Like the front squat, this tends to throw more stress onto the quads and forces the lifter to work harder to stay upright which may or may not be beneficial. In terms of actual programming, as noted in the introduction, split squats can be used as a movement in their own right in situations where avoiding low back stress is required, or when a lifter is limited in how much absolute load they either can or want to shoulder. More commonly, the split squat is used as a secondary leg movement (generally following a 2-leg compound movement). Generally speaking, very low reps tend to work poorly in the movement and sets of 5 or higher would be more common. One big drawback to split squats (and this is true of all one-limb movements) is time as accomplishing the same amount of total sets can take twice as long since each leg is being worked separately. In this vein, my preferred approach is to do all repetitions for one leg, take a rest (usually a minute) and then work the other leg, alternating in this fashion until all sets have been performed. While many like to go straight from one leg to the other, I find that lifters tend to get into systemic/cardiovascular fatigue and the second leg worked always suffers for this reason (e.g. if you do 10 reps on the right leg and go straight into a set of 10 on the left, the left leg set will be impaired due to generalized fatigue). Taking a short break between legs avoids this. Finally, for lifters with a strength imbalance (these are not uncommon side to side), you should always start with the weaker leg and let it set how much work you do with the stronger leg. So if you can only do 100X5 on the weaker side, even if you could get 8 or 10 reps with the stronger side, you should stop at 5 reps. Otherwise the strength imbalance will never go away. Doing one or two additional sets with the weak side only is another option to help fix a strength imbalance. So a lifter might do 1 work set with the strong leg (to maintain strength on that side) and then 2-3 sets with the weaker leg. It would be even more important here to rest sufficiently between sets. Let’s say a lifter was going to do 1 set for the left leg and 3 sets for the right. They might do their first set for the right, rest 1′, first set for the left, rest 1′, second set for the right, rest 1-2′, third and final set for the right.